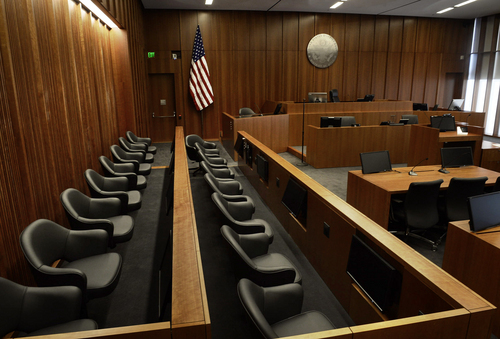 Why all the hate for Salt Lake City&apos;s new federal courthouse? 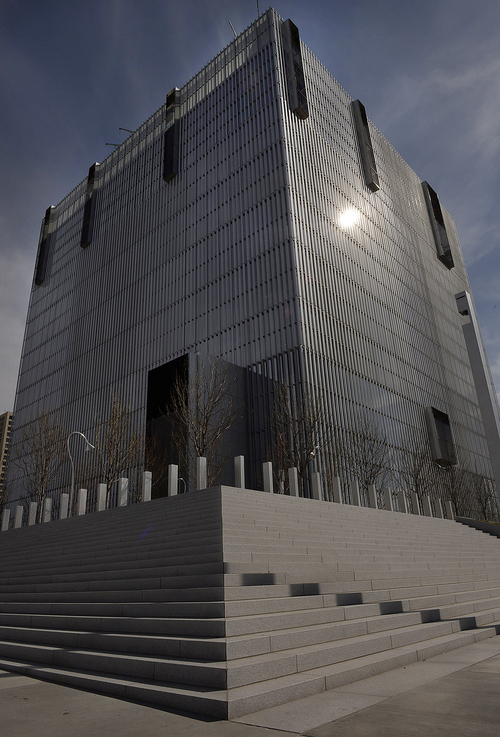 Federal courthouse • Utahns nickname it "the Borg cube" but architects call it a success. Scott Sommerdorf | The Salt Lake Tribune Inside the George Sutherland Courtroom showing the tv screens available to each juror, during a media tour of the new Salt Lake City federal courthouse, Wednesday, April 9, 2014. 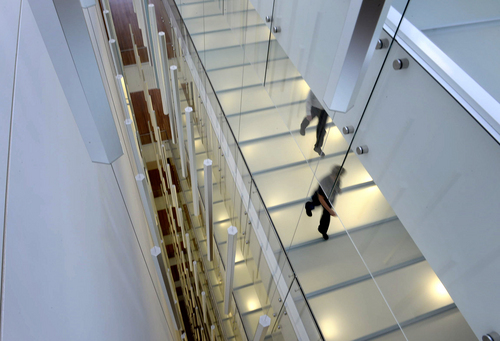 Scott Sommerdorf | The Salt Lake Tribune A janitor cleans a handrail on the ninth floor of the new Salt Lake City federal courthouse, adjacent to an art piece that stretches from the 10th floor to the ground floor, Wednesday, April 9, 2014. 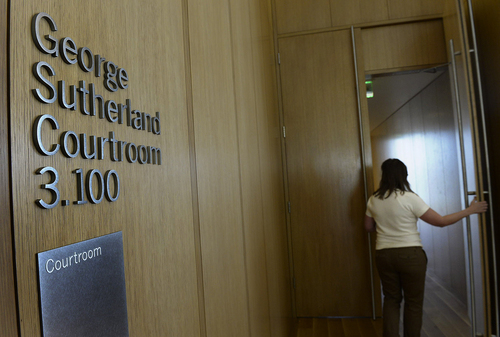 Scott Sommerdorf | The Salt Lake Tribune The entry to the George Sutherland Courtroom on the third floor of the new Salt Lake City federal courthouse, Wednesday, April 9, 2014. 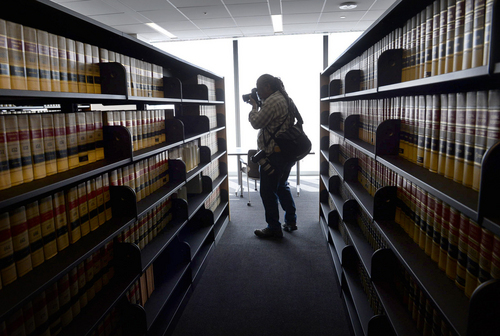 Scott Sommerdorf | The Salt Lake Tribune A photographer makes a photo inside the law library during a media tour of the new Salt Lake City federal courthouse, Wednesday, April 9, 2014. 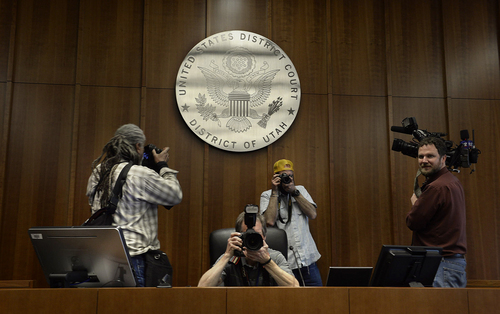 Scott Sommerdorf | The Salt Lake Tribune Photographers capture views from the judge's seat inside one of the courtrooms during a media tour of the new Salt Lake City federal courthouse, Wednesday, April 9, 2014. 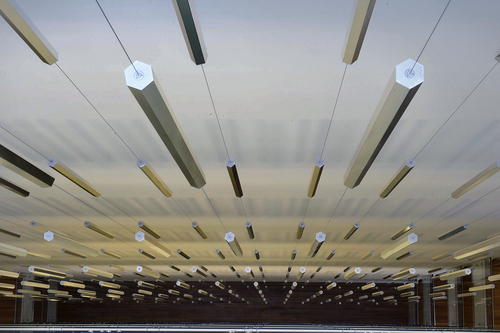 Scott Sommerdorf | The Salt Lake Tribune The ceiling of the new Salt Lake City federal courthouse has panels that move with the sun in order to deflect light onto an art piece that stretches from the 10th floor to the ground floor, Wednesday, April 9, 2014. 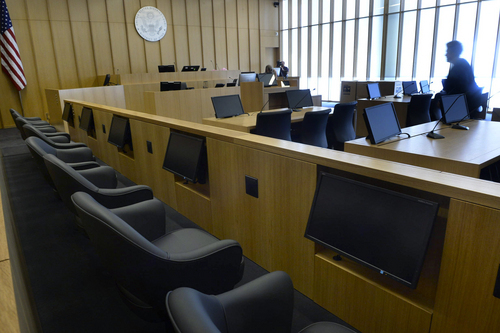 Scott Sommerdorf | The Salt Lake Tribune Looking past the jury box, a view of one of the courtrooms inside the new federal courthouse, during a media tour of the new Salt Lake City federal courthouse, Wednesday, April 9, 2014. 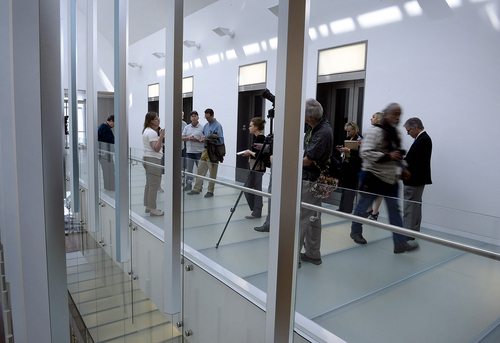 Scott Sommerdorf | The Salt Lake Tribune Members of the media congregate on the tenth floor of the new Salt Lake City federal courthouse, during a tour, Wednesday, April 9, 2014. 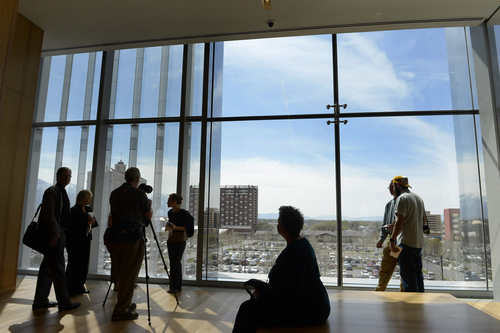 Scott Sommerdorf | The Salt Lake Tribune Looking south through one of the large windows in a waiting area outside one of the courtrooms of the new Salt Lake City federal courthouse, Wednesday, April 9, 2014. 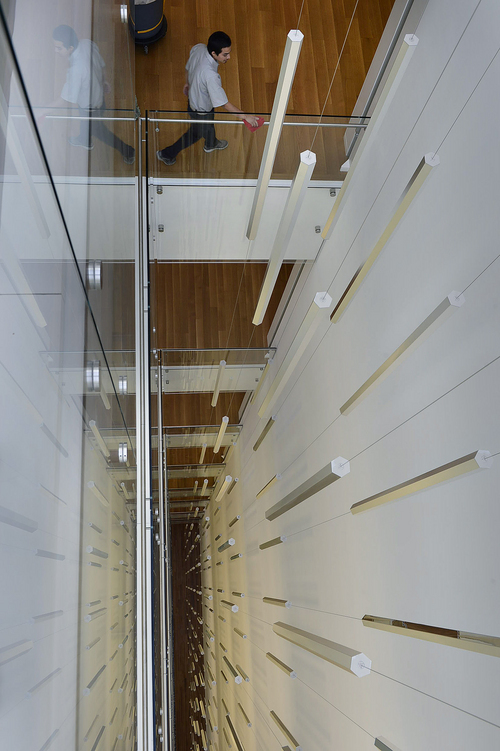 Scott Sommerdorf | The Salt Lake Tribune Looking down from one of the upper floors to the next, one can see others walking on one of the semi-transparent floors inside the new Salt Lake City federal courthouse, Wednesday, April 9, 2014. To the left is an art piece that stretches from the 10th floor to the ground floor. 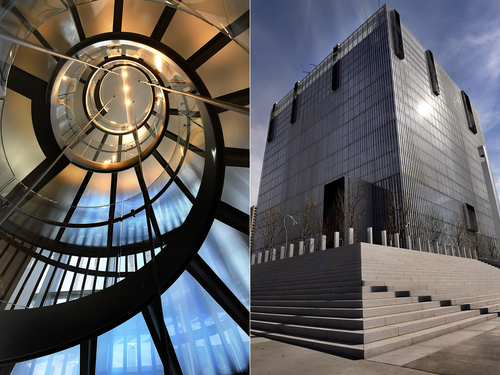 Scott Sommerdorf | The Salt Lake Tribune In these two seperate photos, the interior spiral staircase, left, contrasts with the sterile, blockish exteriror of the new Salt Lake City federal courthouse, Wednesday, April 9, 2014. Scott Sommerdorf | The Salt Lake Tribune during a media tour of the new Salt Lake City federal courthouse, Wednesday, April 9, 2014. Scott Sommerdorf | The Salt Lake Tribune A detail of an art piece that stretches from the 10th floor to the ground floor inside the new Salt Lake City federal courthouse, Wednesday, April 9, 2014. Scott Sommerdorf | The Salt Lake Tribune Some of the law volumes in the new library seen during a media tour of the new Salt Lake City federal courthouse earlier this month. Scott Sommerdorf | The Salt Lake Tribune The exterior of the angular, cube-like exterior of the new Salt Lake City federal courthouse. Imagine being an award-winning chef tasked with creating a spectacular meal. You work hard. You do everything right. And in the end, you succeed: the food you prepare is truly ground-breaking. Now imagine that the people you cooked for can&apos;t actually stomach the meal you prepared. Maybe they&apos;re lactose intolerant and you used a lot of cheese. Or maybe it&apos;s a matter of choice; they could be vegan and you cooked meat, or perhaps everything just tasted bad to them, its quality notwithstanding. In a scenario like this, did you succeed by creating new and ground-breaking food, or fail because it wasn&apos;t what your audience desired? Whatever your answer, if you swap "food" for "architecture" you more or less understand what&apos;s going on in downtown Salt Lake City right now. 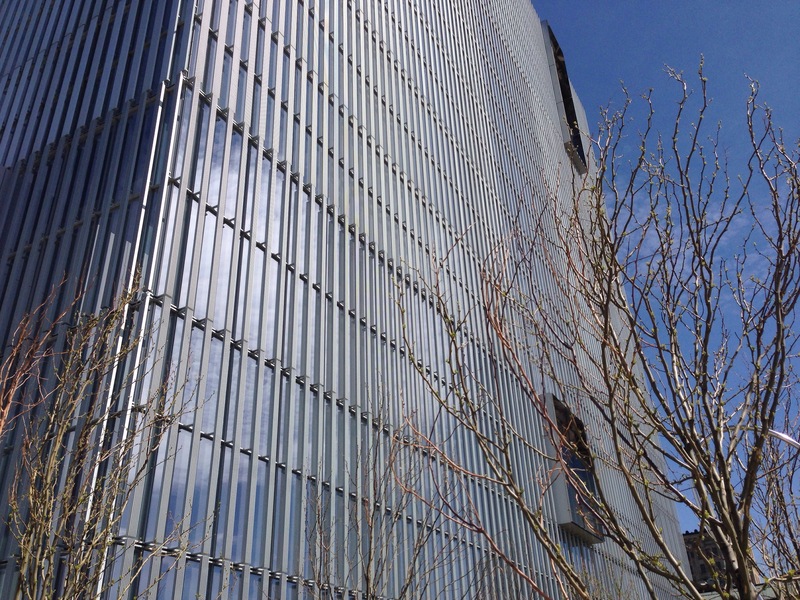 The city&apos;s new federal courthouse opened Monday. The 10-story glass structure, designed by Thomas Phifer of Thomas Phifer and Partners of New York, sits on the corner of 400 South and West temple, dominating the southern end of the skyline. It&apos;s as striking a building as it has been polarizing. On the one hand, many Salt Lake-area architects have praised the structure, saying it pushes the city&apos;s architectural profile to a new level. But much of the general population seems to hate it. The building doesn&apos;t have a name yet, but it&apos;s nickname is more or less ubiquitous: the Borg cube. The name is a reference to the most feared villains of Star Trek, and in this case seems to be a reference both the building&apos;s shape  cubical, like a Borg spaceship  and its feel  austere aesthetic. The intense and very divided opinions over the building raise a series of questions that might as well come straight out of the analogy at the beginning of this article: should success be defined by the experts, or by the audience? Also: why don&apos;t people appreciate something that has so clearly excited professional architects? And what role are buildings supposed to serve in a city anyway? These questions don&apos;t have easy answers and a review of the opinions on either side show that the conflict over the new building continues to rage. It&apos;s not hard to find people who dislike the building. Last week, Jared McKinney walked over from his office across the street to take a look at the structure. McKinney praised the interior of the building, but only hesitantly: "It&apos;s slightly more inviting on the inside than the outside" he said, adding that the exterior felt "dystopian." As McKinney walked away, one of his co-workers mouthed the words, "Borg cube." Those are common sentiments; The Tribune&apos;s story about the opening of the building had nearly 100 comments last week, the vast majority of which slammed it as hideous. The more creative descriptions compared it to the "Central Bureaucracy building from Futurama," "a gigantic air conditioner compressor" and "something from 1950 Eastern Europe." Others simply lamented that taxpayer money was used to such poor effect. Moreover, the building took second place earlier this year in the Tribune&apos;s "ugliest building" poll. It was the newest building on the list and lost only to the Shilo Inn, an offensively rundown example of 1970s kitsch that is about to get a makeover. And like the story about the opening of the courthouse, the poll was bombarded with comments deriding the building. So clearly, this new courthouse generates a lot of animosity. But it also generates respect, most notably from Salt Lake City&apos;s architecture community. 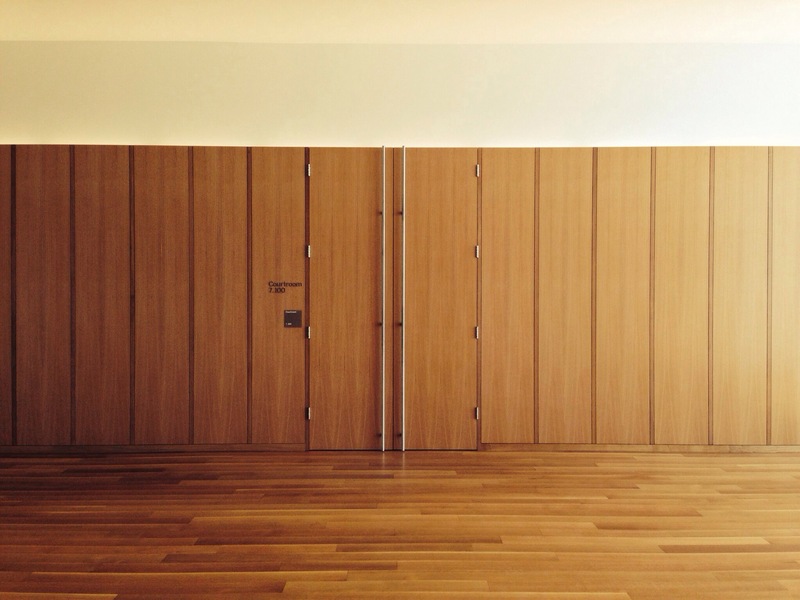 Kevin Miller, president of GSBS Architects (and who had some involvement in the project several years ago), said it was in some ways a "stunning building" with "a very simple very elegant design solution." "It&apos;s a very modern statement," he added. Other architects had similar praise for the building. Peggy McDonough-Jan, president of MHTN Architects, called it a "good piece of architecture," and Jason Foster, of Atlas Architects, called it a positive addition to Salt Lake City&apos;s skyline. "I like the skin of the building," Foster added. "I think it&apos;s far more sophisticated than things we have been exposed to here." Brian Junge, a Vice President of HKS Architects, had similar praise: "I think it&apos;s a very good modernist piece for the city." Significantly, however, none of the architects who spoke with The Tribune simply called the building "pretty." Instead, for them, the idea was that it pushed the envelope in a city that lacks much envelope-pushing architecture. It is, in other words, intellectually engaging. In that regard, Miller compared the building to a work of art. 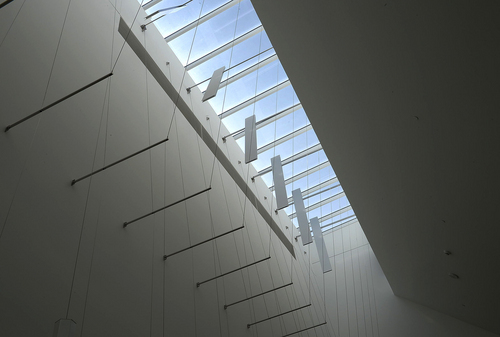 He called it an "aspirational design" that tries to capture the values of government and the justice system  transparency, fairness  metaphorically with light-drenched courtrooms, among other things. McDonough-Jan also spoke of the building&apos;s themes, conceding that the design is austere, but speculating that perhaps that was part of the message. 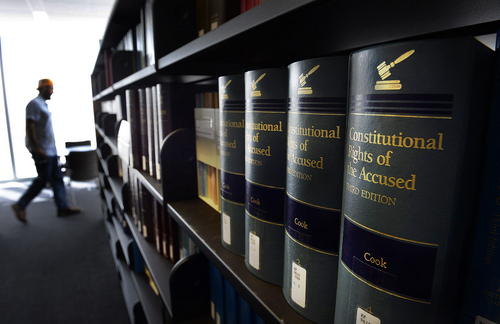 "It does evoke some of the ideas of the justice system, which really has two sides," she said. "It&apos;s about justice as a good ideal, but its also about the more punitive aspects." The architects who spoke with The Tribune were well aware of the popular disdain for the new courthouse and several said it may fall short by, in Miller&apos;s words, "not quite connecting with everybody." They also speculated that popular tastes in architecture may tend toward the nostalgic and the richly embellished, concepts decidedly out of favor in the modernist school of thought that produces buildings like the new courthouse. That may be part of it, but it may also be that many non-architects see buildings as serving a fundamentally different role in cities. For those who call the courthouse ugly, "good" or "successful," architecture isn&apos;t necessarily supposed to be "challenging," a word McDonough-Jan used to describe the courthouse, or aesthetically confrontational. As far as public opinion goes, cohesion with the surrounding urban fabric evidently trumps artistic flare. To borrow the art metaphor, the general population seems to see buildings as brush strokes on the canvas that is a city, rather than stand-alone works meant to be taken on their own. From that intellectual framework, the new courthouse likely does fail. It&apos;s surrounded by a bleak and searing plaza that is unpleasant in the spring and will likely be even more so in the sweltering summer months. Its monolithic walls offer nothing of particular interest for pedestrians on the surrounding sidewalks or views from afar. In fact, from any distance beyond about a half-block it feels pretty close to boring. And the fact that the form is a perplexingly static cube doesn&apos;t help either. The interior of the building is truly remarkable, but unless a person is steeped in modernist and technical knowledge about design, the building seems to many people more awkward than engaging. Which isn&apos;t to say Salt Lake City&apos;s new federal courthouse is a failure in any absolute sense. Rather, like a great meal, success is measured differently by the experts and the consumers.